Over the past 5 decades I have been given the distinction as the Whale Man, the Kayak Man, and the Jane Goodall of the Sea – I am humbled. Titles recognized due to my one man endeavor as a writer/lecturer in which I have devoted my life to the preservation, beauty and sensitivity of our world's oceans, primarily the surrounding waters of the Hawaiian Archipelago. 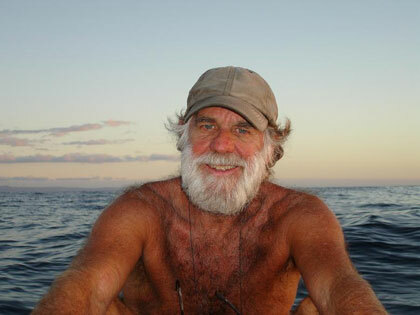 My Journey: After my military tenure in 1966 I sailed from Hawaii as crewmember on many sailboats which took me on a 3 year voyage to three continents with surfboard, backpack and sleeping bag in search of waves. Shortly after my return I crewed on a sailboat to the Pacific NW-- where I was introduced to the sea kayak, and what was to become the foundation of my life. Back to Maui, and with the help of a few friends I built my first sea kayak from laminated plywood. Shortly after the opening of Kimo's restaurant in 1977, I ended my restaurant career and worked as a beach boy at the newly built Kapalua Bay Hotel. With no transportation, I would paddle the 10 mile trek to Kapalua Bay leaving my home from Lahaina around 2AM. I would sleep on the beach for several nights and paddle home on my days off. These paddles created the foundation of what became a way of life, observing nature peacefully and with respect, from the Eyes of a Kayak, where (if you listen – you will see). The density of the sea is 800 times that of our atmosphere -distinguished as the world's largest echo' chamber where sounds made by species such as whales can travel thousands of miles if uninterrupted by ambient noise, allowing species to keep in touch with each other, locate food and migration routes. I have no idea what motivated me, however I approached the General Manager of the Kapalua Bay Hotel, Mr. Brett Huske with a proposal of presenting weekly talks. I studied and observed weather, currents, tides and sea life. I received permission to read through the diaries of whalers who visited the off-shore waters of Lahaina, and studied the geological make-up of the Hawaiian Islands. My weekly talks drew guests from other resorts, and I was soon presenting weekly programs at the Kapalua Bay Hotel, and the Maui Prince Hotel in Wailea. My signature presentation "From the Eyes of a Kayak" has been presented to conventions, colleges, The National Geographic Museum to South Africa. I continue to speak at conventions, private luncheons and dinner gatherings, and for the past 25 years I have been presenting weekly talks at the Mauian Resort on Napili Bay. Alone with the sea, I began extending my horizons, -- crossing the Auau and Pailolo channels to Lanai and Molokai. 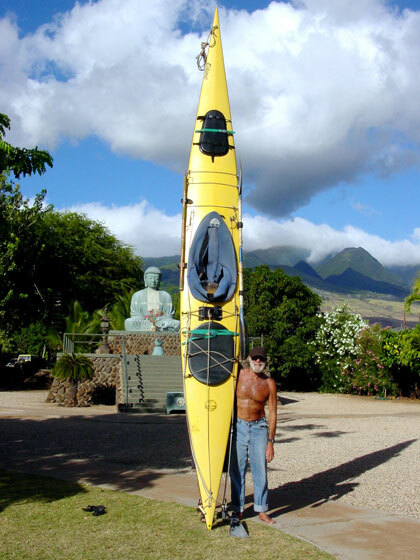 Since the 1970's I have logged more than 30,000 miles of kayaking, circumnavigating Maui, Lanai and Molokai on many occasions. My longest trek was the 18 hour paddle in which I encountered ground swells up to 15 feet in crossing the Alenuihaha channel from Maui to Waipio Valley on the Big Island. Week long periods at sea, eating and sleeping from my sea kayak while the singing and breathing of North Pacific Humpback whales fill the atmosphere. A familiar female slowly surfaces alongside - I reach out and touch her, the two layers of skin covering the blubber wrinkle, identified here in Hawaii (chicken skin). Many have told me my life has been a meditative journey. I have been blessed, and truly believe my life has been made possible by the first sentence of my self-published book: Anything is possible in life if you truly dedicate yourself, maintain sincere discipline and believe". My journey. To live in the moment is the only real thing in life. The past is gone, the future? Only the present counts, along with many heartfelt memories. As a Mahalo for this journey, and my 70th birthday this November, I want to give back to Maui, and will donate $200.00 which is within my means to Surfrider Foundation of Maui. I feel it's not about the amount, but the gift of giving. I believe it is a Japanese custom to give upon one's birthday. My life with the Kai (sea) the Aina (land) and my close relationship with the people of Hawaii, their music and culture, has truly been the greatest blessing of my journey. My daily life: meditation, exercise, yoga and service to others. Thousands of miles from land, open ocean ground swells move silently, without interruption – without destination – with virtually no boundaries, they circle the globe of planet Earth on and infinite journey. The Sea's constant movement, unending energy, strength, calmness, spaciousness and secrets of the abyss are mystifying – A time in which the mind wonders, allowing peace, silence and stillness within. Gazing upon the horizon, sea and heavens come together on a never-ending journey. My thoughts go far beyond, and I too, long for that feeling of infinite, as the universe – there is no end. All things – Earth and the heavens – are connected – we cannot live alone.